New Year's Eve 2019 is coming this December. How will you celebrate seeing in 2020? That's right, the last evening of the year is approaching fast. The 31st December is such a special day and night. Here at NewYearEve.com.au we have that date as one of the very Big Days of the year. On NYE, all around Australia, events and parties are held to celebrate the seeing out of the old year. Some of the best NYE fireworks events and parties from around the world are held right here in Australia. Planning is underway for the lead up to midnight on 31st December 2019 as we all get ready to welcome in 2020. For those that might be coming to Australia from the northern hemisphere, it's important to note that Australia's New Year's Eve celebrations occur in Summer time. So, for the most part, the outdoor NYE fireworks are held on evenings with great weather. Add to that the spectacular Australian city backdrops for the NYE Fireworks displays and the 31st December is something special. These city events attract large crowds with fabulous party atmosphere and many international travelers come to Australia for that excitement. The NYE Concierge is always on the lookout for fabulous events and great deals for New Years fun. Make sure you checkout the NYE teams thoughts and reviews. Sydney is one of the New Year's Eve wonders of the world. The spectacular Sydney Harbour is an amazing amphitheatre with most of the NYE fireworks displays starting on barges on the Harbour or the Sydney Harbour Bridge. So the views are spectacular from all around the Harbour edge and even tall buildings within the city. There are so many thing to do in Sydney for New Years Eve. Lots of party and event choices in Sydney and cruises are just a natural for this wonderful event where the NYE fireworks shimmer over the Harbour. Some great options include a NYE Cruise with Sydney Harbour Escapes. A NYE Dinner Party at gorgeous Athol Hall or try partying at the All Hands Brewing House in Darling Harbour. Sydney New Year's Eve has to be on the bucket list! See all the great ideas for NYE in Sydney. Melbourne is Australia's second largest city. It is a fantastic city. Vibrant and alive, and New Years Eve is done so well in Melbourne. Being summer the parks and gardens look marvelous and with NYE fireworks over the Yarra River and the city buildings all the way to the water of Docklands, it's just made for one big spectacular party. There are plenty of event venues with great views of the fireworks all over town and even cruises in docklands and on the Yarra River. Melbourne NYE Ideas and Events. Brisbane is one of Australia's northern most major capital cities and being part of Queensland in summer time it just adds up that New Year's Eve will be celebrated outside with lots of sensational NYE Fireworks over the Southbank and Brisbane River areas. Fabulous comfortable weather should be the order of the night on the 31st December if all goes to plan. Then there are lots of great venues and events in Brisbane to see out 2019 and bring in 2020 in Queensland. What's on in Brisbane for NYE? Perth lights up for the New Year's Eve celebrations on the 31st December and great options for being outdoors or al fresco with events in the city and burbs and down by the Swan River. We think of Perth as being one of Australia's younger cities and hence the fun and enthusiasm is alive! New Year's Eve parties are well attended in Perth and some of the best parties we've seen sell out early so very important to get in early! What's on in Perth this NYE? Hobart is one of the bigger growth cities for NYE. With the Sydney to Hobart yacht crew all in the harbour after their race the beautiful Sullivan's Cove and Derwent River are alive with activity. Taste what Hobart has to offer this NYE. Hobart NYE ideas. Adelaide is one of those quiet achievers for New Years. The parklands and Torrens river serve as a centre backdrop to spectacular fireworks. What's on in Adelaide this NYE? It's golden sunshine on the Gold Coast of Australia for NYE. The Gold Coast is portrayed as fresh and energetic and this is represented in the fabulous New Year's Eve party options.Details of Gold Coast New Year's events. Canberra is the national capital of Australia and the canvas of Lake Burley Griffin is awesome for the midnight NYE fireworks. Enjoy what Canberra has to offer this 31st December. Ideas for Canberra this NYE. Don't forget Darwin for NYE this year peoples. The venues and council in the top end Harbour area of Darwin are planning super fireworks displays over the water, and let's face it, the temperature and Northern Territory people are awesome. Details of Darwin NYE. Certainly YES, it is time to plan your New Year's Eve to make sure you see in the new year in style. NYE is probably the biggest of all the Big Days party events. 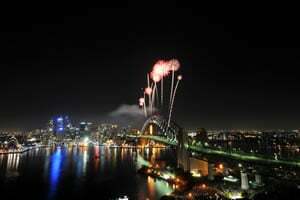 We have been covering New Year's Eve in Australia since 1998. That's right, yes we saw in the millennium for year 2000 and over the years we've watched fabulous New Years events and parties grow with great people running them. And NewYearsEve is a trusted source of what is out and about this NYE. Whether it is themed parties like Masquerade, 80's or 90's or Naughties, Beach parties, Glitter, MadMen and other fun ideas. Or it could be a type of NYE party like Cocktail or Dinner setting or inclusive packaged drinks. So you can see along the way we've seen a fair bit. We also decided to use that NYE experience to help cover some of the other Big Days through the year. So now NYE and NewYearsEve are more, they are a part of the Big Days. This is where we put to use all the experience we have of nearly 20 years to more days and nights thru the year. Make sure you checkout About Us for all details on NYE and other Big Days through the year.